Flavorful marinated dried tomatoes, Italian herbs, black olives, goat and sheep feta cheese make an easy and very tasty vegetarian polenta. Heat the olive oil in a medium sized stock pot over medium heat. Add the onions, garlic, salt, and pepper. Sauté for 5 minutes until onions soften. Add and sauté teff and corn grits for 2 minutes to season the grains. Lower heat, and slowly add boiling water. Cover and simmer 15-20 minutes or until water is absorbed. Add kale. Let it steam on top till it turns bright green, about 3 minutes. Turn off the heat. Add and stir in basil, oregano, and thyme. Taste and adjust seasonings, if desired. Transfer to a pie pan. 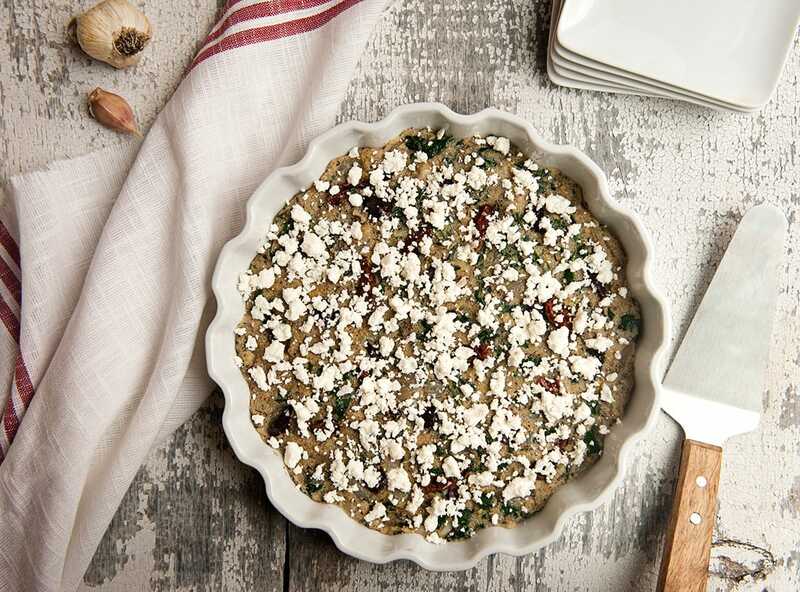 Decorate with marinated dried tomatoes, olives and crumbled feta cheese. Eat immediately, or let it set for about 20 minutes before slicing and serving.